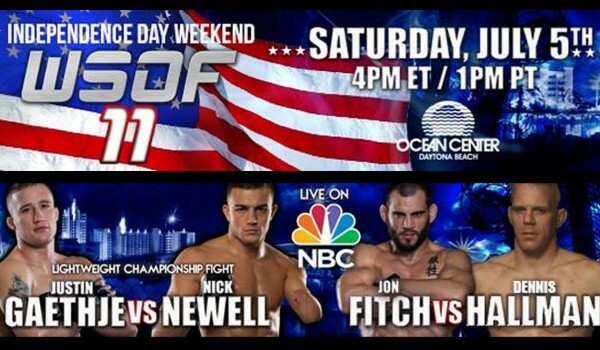 Today in Daytona World Series of Fighting presented WSoF 11 live on NBC. Yes, NBC proper, not NBC Sports Network, but actual broadcast television. WSoF 11 saw quite a few solid fights in the lineup making it a worthy addition to our already jam-packed weekend of MMA offerings. The show opened up with Melvin Guillard taking on Gesias “JZ” Cavalcante in an exciting back-and-forth bout that saw Guillard take the action to JZ in the second round to score the stoppage. Next up was a quick scrap between Cody Bollinger and Pablo Alfonso that saw Bollinger quickly work to Alfonso’s back and lock in the rear naked choke. It was short and painless (at least for us viewers). Jon Fitch was in action against another UFC alumni in Dennis Hallman. Hallman, perhaps best known for wearing a speedo into the ring was in board shorts today of an American Flag variety, but even that wasn’t enough to keep Fitch away from, err, Fitching the fight for the decision. The big feature bout on WSoF 11 was a WSoF Lightweight Championship bout between the champion Justin Gaethje and rising superstar Nick Newell. Newell put up a good fight early on, but Gaethje was finding the right hand early and often throughout the fight. Newell was in a bad way near the end of round one but survived to the second round. It was almost academic from there that Gaethje scored and was able to finish the fight in the second round.